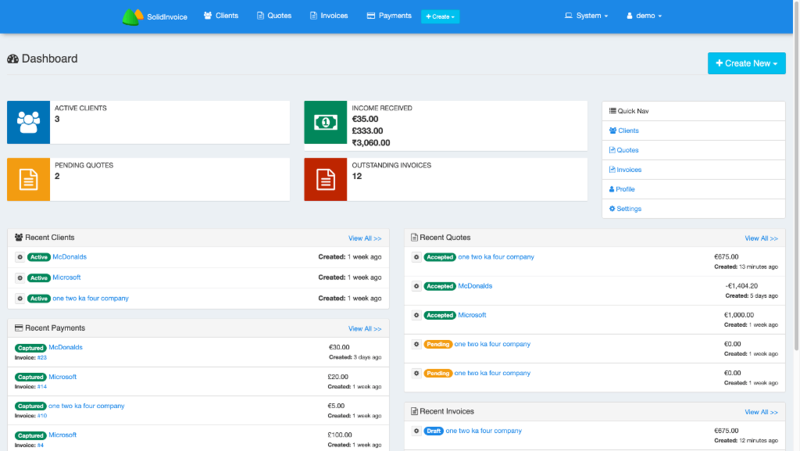 Simple and elegant invoicing solution. Capture all your client information in an easy to use client management interface. Send quotes to your clients and convert quotes into invoices. Send invoices and keep balances up to date to know exactly how much income you should receive. Receive online payments through a number of different payment gateways. Send recurring invoices on a flexible schedule that matches your business. Multiple currency support means you can bill your client in any currency that they prefer. A powerful and flexible API makes integration into any other service so much easier. Free and open source software means you can customise SolidInvoice as much as you want to fit your exact needs. © 2018 SolidInvoiceAll rights reserved.